Design Hosting Domain alles in 1 service! 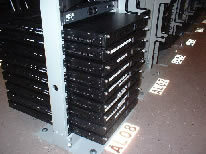 Servers are located in a 28,000 square foot collocation facility. The carrier-neutralf acility is fully equipped with uninterruptible power, fire suppression, environmental systems, security and raised floors. Datacenter is located no more than 200 feet from most of the major fiber backbone providers in the city, many of which are already in, or have made plans come into our facility. Two separate fiber ducts provide entry directly from our manholes at the street to the "meet me room," and afford carriers immediate access to the facility. Entry for many carriers has been accomplished within hours, as opposed to weeks or months at other collocation facilities. Our knowledge of the products and services offered by the carriers within our facility, as well as those outside, can help customers expedite and complete their network requirements. Colo4-Dallas will, upon request and on behalf of the customer, obtain pricing and availability from a multitude of providers. With several options in hand, the customer can then choose what is best for them.